Import-substitution industrialization in the 1950s was by default because of severe shortages of the consumer goods, providing lucrative incentives for the private sector for establishing consumer goods industries. During Ayub era it was by design. It had no doubt put Pakistan on the trajectory of rapid growth but had now run its steam and its negative after effects were emerging. Capital goods industry had been totally neglected due to easy availability of profitability in a protected market for consumer goods. Proverbial shyness of the private sector to avoid unnecessary risks and lack of finances at their disposal to establish capital goods industries had led to a lopsided industrial structure. 1960s was the time to start rectifying this anomaly but it was lost. Foreign assistance coupled with generous fiscal and non-fiscal concessions to the industrialists during the Ayub period continued the same pattern of industrial development with few exceptions. There was excess capacity impeding against competitiveness of the goods produced to export. Lastly, rising inflation in the western countries had made the import of capital goods expensive beyond the capacity of the private sector. Coupled with the decline in international demand for Pakistani goods put a seal on the viability not to speak of their expansion. The nationalized units brought with them accumulated losses of Rs.254 million. These could have survived only due to heavy injection of finance by the state. Indeed the perfect article I read so far ! Though the writing is not that much bad but lack of many facts and figures. This is because of some reasons , which affect the writer personally by butto Era and Writer was being brought up in such frustration which can we feel in people of Bangladesh in present days . Ok Bhutto wrote a fancy letter to Iskaner Mirza (a dictator) who was exiled by his Selectee Ayub Khan. Thats what all politicians do even IK did it but both retracted. People blame IM for the first martial law, but support Ayub, Yahya, Zia and Mush shows they actually want to save the usurpors. Lakhani sahab it was the MILITARY who never accepted the results of 1970. If they were so pious they could hve hung him there and then. “The defence of East Pak lies in the West Pak” is not a Bhutto statement. 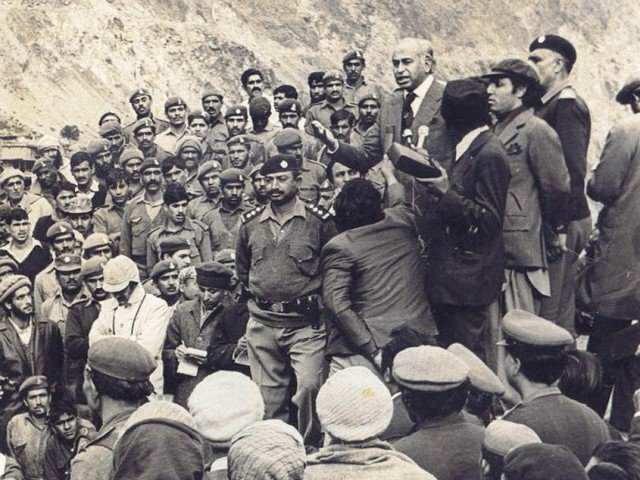 ZAB was a scape goat of that drama, its hero’s all lived namely Yahya who was even given a full military burial by none other than Mard e Momin. Military did not want a strong political leader, PNA drama was launched and rest is history. Today we have religious extremism and MQM! Good luck! HEre is A G NOORANI on Polish Resolution “Political exploitation of the famous “Polish Resolution” in the U.N. Security Council in December 1971 during the War by critics of Zulfikar Ali Bhutto has led a similar reaction by his admirers. There is another school as well. It comprises of an official with a marked bent for scholarship and two diplomats of outstanding calibre who served during that period. Sultan Mohammed Khan, as Foreign Secretary, and Jamsheed Marker as Ambassador to the Soviet Union. Both hold that the Polish Resolution would have been of no help to Pakistan in its hour of need. Tersely put, the Resolution provided for a direct transfer of power from Islamabad to Dhaka; for the withdrawal of Pakistan’s forces as well as India’s forces and a return to the status quo ante bellum. Not a single prisoner of war would have been held by either side nor an inch of the territory of the adversary State. The cease-fire line would have stayed put. There would have been no surrender of Pakistan’s forces to the Indian Command. And there would have been no Simla Agreement, either. The author did not mention the release of almost 92000 pakistani soldiers ? I agree 100% with Shakir Lakhani Sb. Yet, we see Bhutto everywhere in Pakistan..
forgiveness is for those who ask for it, comparing Bhutto to Musharraf, I cannot see any reason how Musharraf could have put more damage to Pakistan than Bhutto himself, Musharraf did not claim that the judges debacle was a mistake on his part and I sort of see his point, he admitted NRO and the deal with Benazir and Nawaz was a mistake and he asked for forgiveness. Bhutto on the other hand actively went ahead and divided Pakistan. Now I can see why Musharraf “might” have called Benazir and Nawaz back, because he knew he was going and the country needed some sort of leader with experience, Bhutto just straight out refused to follow constitution and give the PM seat to a East Pakistan party and threatened any of his supporters. Bhutto throwing snakes at jalsas. The creation of infamous Al Zulfiqar. Ban on 5 people gatherng. Bhutto exempted from land reform. Murder of his political enemies and opponents. His inability and unwillingness to compromise with Sheikh Mujib ur Rehman. Creation of student unions , which we suffer to this day. Why was it bound to fail? A similar idea is working extremely well in Israel, even though Jews are both a racial and religious group. You can say whatever you want about their policies; but it is also a nation founded as a homeland for one diverse group of people, just like Pakistan. I think Jinnah died too soon into the formation of the country to properly define what Pakistan meant according to his vision. In addition, there simply weren’t any strong or visionary people around him to continue and build on his vision. India, on the other hand, had multiple people to lead on various fronts (political, social, etc) in it’s infancy. The military government of the time and ultimately India’s military intervention was responsible for the breakaway of East Pakistan. Bangladesh was a reality and no one could stopped it even with much talked about of the Polish Resolution. If “roti, kappa aur makan” was Bhutto’s ruse, then he was the first person to give the common man the sense of belonging and dignity. He remains unmatched in international politics and paved the way to create the Islamic Umma through the famous Lahore Resolution. Another feather on the cap was to start our nuclear programme. A new Constitution was adopted unanimously when a generation of politicians failed. 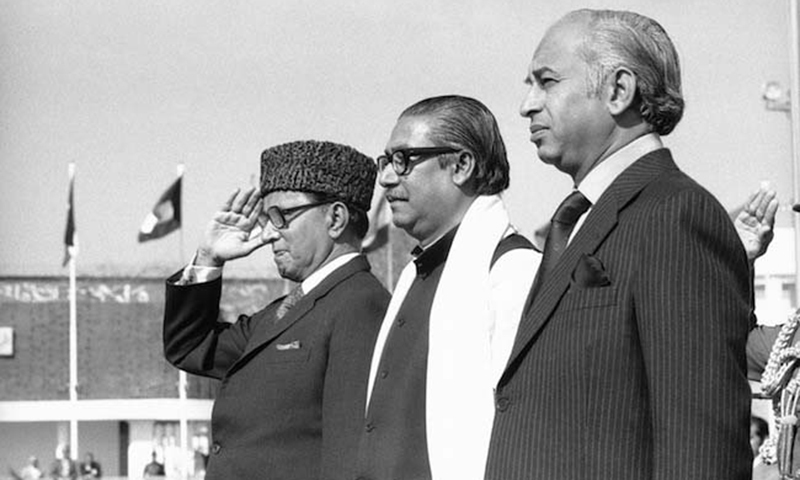 It was Bhutto who released Mujib and ended the doctoral rule of Yahya. His death by hanging was a painful drama under Zia who pocketed the judges. Some of the trying judges afterwards even admitted to the injustice of the “trial”. Bhutto may have his faults but he was a great leader who wanted Pakistan to be in the forefront in every platform. His rule was sabotaged by the military and a gang of like minded politicians, the PNA supported by the military. I feel Pity for you, how can you blame the fall of East Pakistan on ZAB ? 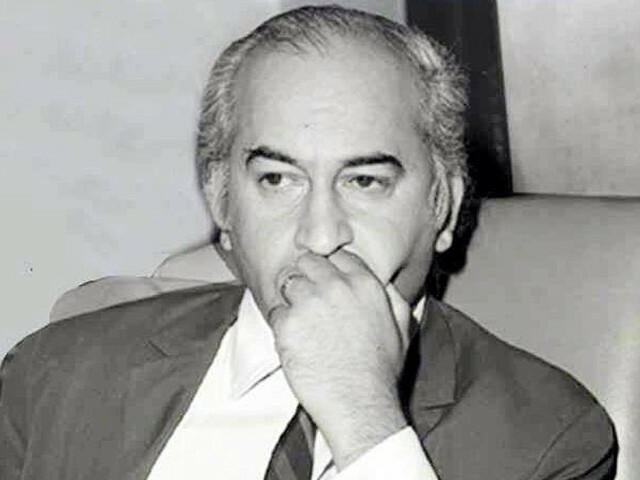 Bhutto is on the record to have warned in two public meetings — one in Karachi on 11 September and the other in Multan on 8 October — that the integrity of the country was at stake, at which Yahya called him and told to be not “so pessimistic” because his regime “would not allow the dismemberment of Pakistan”. 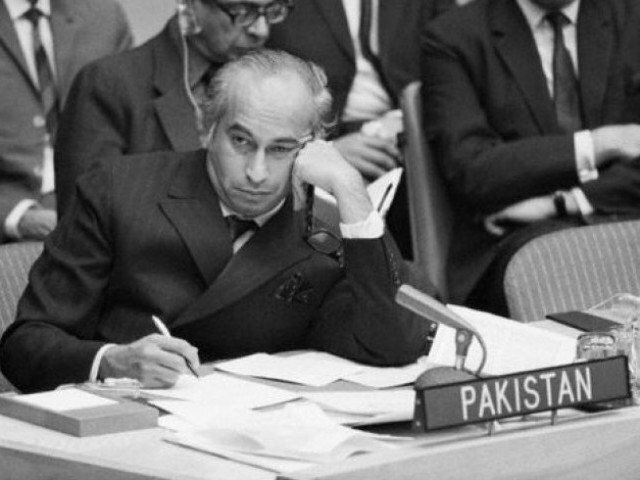 As Yahya had virtually divorced any meaningful political option and intended to pursue the military solution, Bhutto left the country in disgust. Excellent Article and also excellent for the students who never seen the real face of Bhuttoism. Well written. We are a nation so easily misled and keep on dreaming despite knowing what is wrong. Bhutto was a egotistical man and he is responsible for all what we faced then and destroyed what was there. The parasites like zardari and his ilk made sure that they could milk the hollow dream and it continues to this day. The second phase of destruction started with Nawaz sharifs first tenure where he killed all local manufacturing by hiking tariffs on raw materials and parts and lowering duties on finished products. Bear in mind, the Murder of History is a very well thought out correction of Pakistan’s History. K.K. 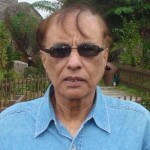 Aziz is independent of Bhutto, and considered only the texts used to teach students and people in Pakistan about Pakistan. Agree >100%. Beautifully worded and precisely summed historical facts by Shakir about Butto-era. Can’t say any more to be added about a cunning and evil genius man. So sharp, he once replied to a sycophant who flattered by telling people say I have resemblance with you, “Yes – I know my father was a naughty man”. Neither your Quaid wanted it, nor our leaders in East Bengal at the time were enthusiastic about it. Politically, it was always seen as rather difficult to administrate two geographically distinct provinces so far apart in distance as well as being separated by an arch-enemy. Then too, the linguistic and cultural differences were rather stark. Add on top of all this, both sets of populations were illiterate and extremely impoverished. Bad recipe. Suhrawardy’s plan was to split off an independent Bengal [East + West] from British India. Jinnah was amenable to this, since he thought the potential United Bengal would be Muslim-majority and friendly to Pakistan. Jinnah also didn’t want a Bengal without Calcutta, a booming industrial centre at the time. He really didn’t care about East Bengal at all; it simply wasn’t part of his interest. It was not He alone who did this. Army and President Ayub were squarely responsible for war 65 and that is the truth .What followed thereafter was the returns on investment ! You are correct sir, that’s the mistake there ancestors committed and founded Pakistan. Right in 48 they realised it. One cannot dwell with cruel people, ultra chsuvinists and highly narcisissts. The bengali’s were far eurdites and had unfathomed treasure of literary genius whith, patriots time and again accepted gallows. In the field of science and technology they were the torchbearer of civilization. And Pakistanis were kept deaf and blindfolded. The only thing the were taught in home and schools at large in their society were hatered. I had firsthand exprience,although I have some of my life’s best friends again Pakistanis. I do wish their success and prosperity in their nationhood. I will be the happiest person to see successful Pakistan a heaven on earth, long cherishd by the people at large..of Pakistan…..